﻿ Content Wise Nani Won Over Vijay Devarakonda! 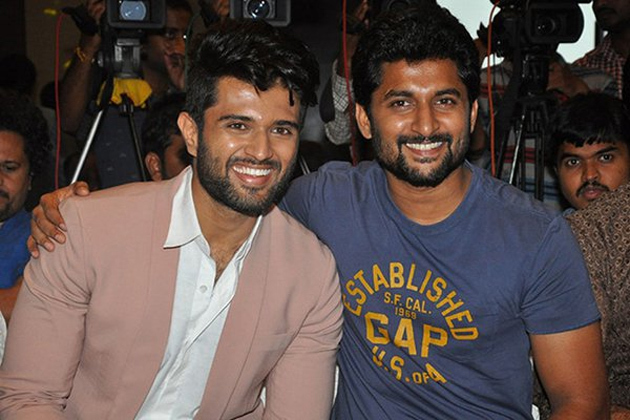 There is no doubt that Nani and Vijay Devarakonda are the two potential big stars who are looking at a bright future ahead of them. They may not become as big as Chiranjeevi but they have the potential to entertain audiences for a long time. Also, a good natured, matured and healthy competitive spirit will only help the stars and indirectly audiences too. The films quality will rise and audiences can enjoy better content. Both of them are coming with their movies in April and May. Jersey, Nani starrer already released a teaser and two songs too, as it is releasing in April, on 19th. The first teaser of Vijay Devarakonda's Dear Comrade also came out recently. When you compare both of them, Jersey looked more intriguing and revealed some content too. Dear Comrade just showed a passionate kiss and fight. Hence, as per content on social media discussions, Jersey won the bout without any questions.